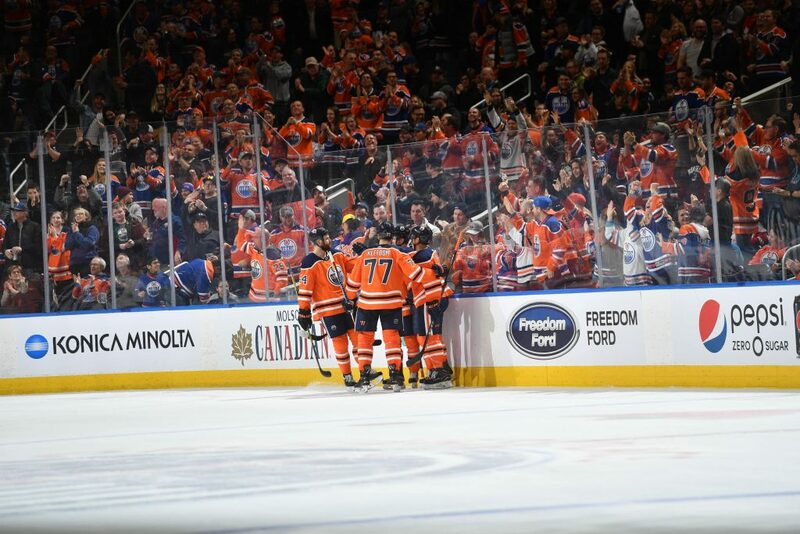 After a five-game road trip to start the season, the Edmonton Oilers start 2018-2019 at home vs. the Boston Bruins (Oct. 18). The following week they meet their co-titleholders for most Stanley Cups, the Pittsburgh Penguins (Oct. 23) and reigning champs the Washington Nationals (Oct. 25). The Oilers host their Battle of Alberta rivals the Calgary Flames at home twice this season (Dec. 9 and Jan. 19). On New Year’s Eve (Dec. 31), the Oilers face their old WHA rivals the Winnipeg Jets. Other hot-on-the-ice faceoffs this season include NHL upstarts the Vegas Golden Knights (Nov. 8); the perennial post-Gretzky grudge match vs. the Los Angeles Kings (Nov. 29); and last season’s Eastern Conference titleholders the Tampa Bay Lightning (Dec. 22). In the New Year, the Oilers bring in fellow Pacific Conference contenders the Anaheim Ducks (Feb. 23) and the Vancouver Canucks (March 7). The last regular-season game at home for the Oilers this spring vs. the San Jose Sharks (April 4). The Oilers, founded in 1971, play their games at Rogers Place, which is owned by the City of Edmonton and was completed in 2016. For NHL and WHL hockey games, the arena seats more than 18,000 attendees. (The venue also hosts concerts and basketball games.) Fans arrive to Rogers Place, and its 9-foot-tall bronze Wayne Gretzky statue, by city bus or via MacEwan Station on the Metro Line. The Oilers have won the NHL’s Stanley Cup five times. Stay up to date on the Oilers all season on Twitter @EdmontonOilers. NHL, the NHL Shield, the word mark and image of the Stanley Cup and the word mark NHL Winter Classic are registered trademarks and the NHL Winter Classic logo, NHL All-Star logo and Original Six are trademarks of the National Hockey League. NHL and NHL team marks are the property of the NHL and its teams. © NHL 2018. All Rights Reserved.